We’ve had approximately 1.5 “crisp” mornings around here in South Texas, so I can officially proclaim it F A L L. Bring on #pumpkineverything! I’ve always envisioned family traditions that are just “ours” - one of those idyllic notions that comes with motherhood. My girls are 3 and 5, and I can’t say we’ve established a ton of traditions at this point. This bugged me up until now, but I had a revelation the other day…they’re still so young! We’re making memories now, and I feel like the traditions will fall into place as they get older. Without further adieu, I share with you our list of Fall Family Memory Makers. We have 2 we usually visit just because I like to take no less than 50,001 photos of my children and pumpkins. Please note my children have no interest in being photographed with said pumpkins. It’s also usually one billion degrees hotter than is acceptable for pumpkin patching, but we do it anyway in our fall attire. Kara posted a #simplywholesnacktivity last spring featuring Apple Donuts, and I’ve had it on my list to do since then. My girls love any excuse to play with food, so I think they’ll love this. Apple slices, almond butter and toppings - easy peasy! We’ve already had one round of this, and the girls had a blast. I forgot to pull out the glitter glue/paint I bought for decorating pumpkins, so I think we’ll try it again to cure an afternoon of boredom. My girls go all in with the paint - it ends up turning into a finger painting session. We’ve placed some pumpkins strategically around the house, but they keep getting moved by some tiny people who live here. It’s like Elf on a Shelf but with pumpkins. I try to keep things super simple to avoid clutter and unnecessary items to store year after year. Okay, this sounds a lot lot “Pumpkin Painting”. This will be much less messy thanks to our EasyTeesy decals! 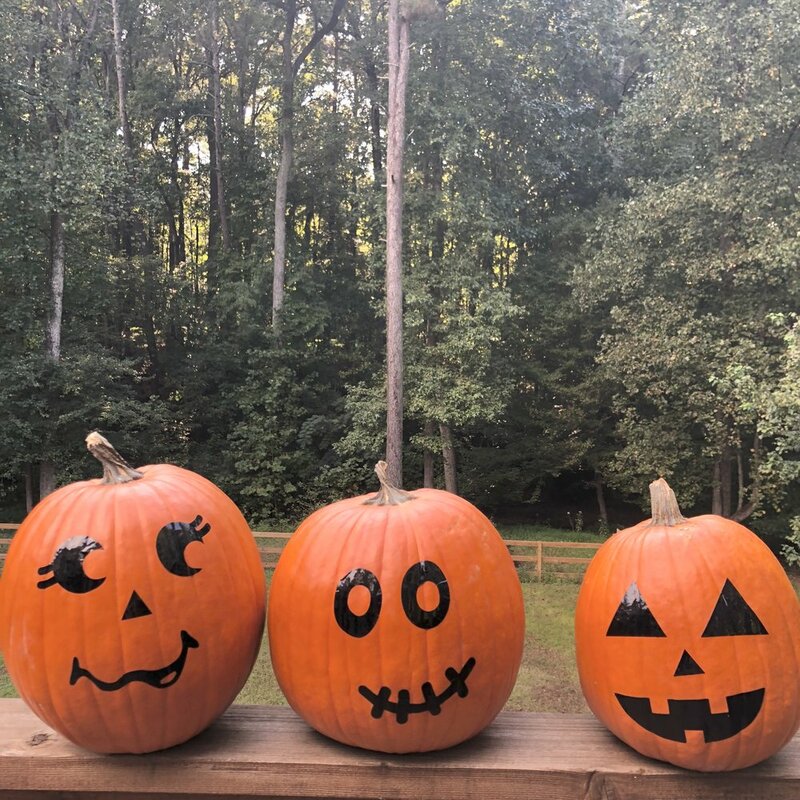 (Big thanks to EasyTeesy for sharing this photo of their cutie pumpkins!) I’ve been so excited about these. 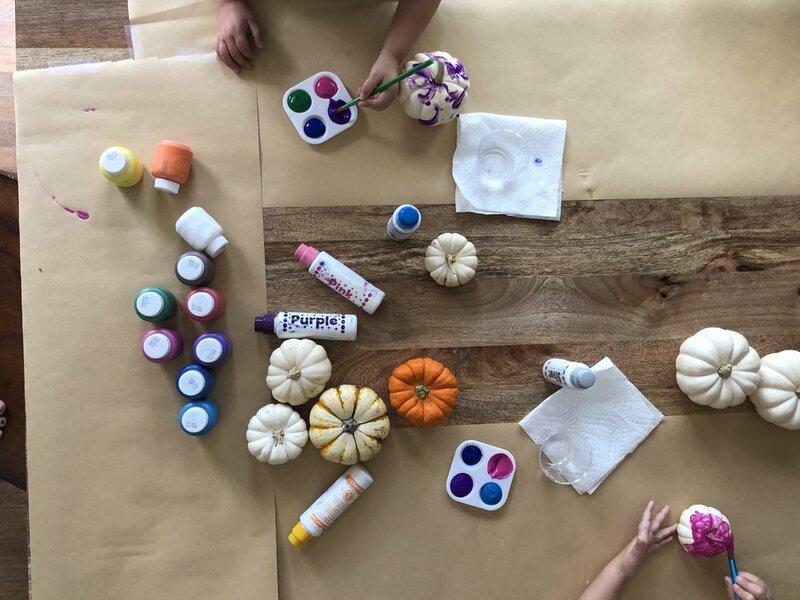 Peel and stick to pumpkins and boom - decorated pumpkins. No pumpkin seeds everywhere. No smelly pumpkin innards. No treacherous carving tools. Win. Win. Win. This is something that we’ve been on the receiving end of the past couple of years, and it’s very fun. Basically, fill 2 to 3 (or really however many you want) bags, buckets, again, whatever you want, with a few fun Halloween treats. It can be candy or something fun like Halloween stickers. The goal is not to spend a ton of time and money overdoing this. The goal is to create a surprise “Boo!” for your neighbor. Pinterest is FULL of templates for these to print out and attach to your Boo Bucket. This mama is not going to reinvent the wheel here. My girls love receiving these surprises and also love assembling them to pass on to another neighbor. Last May we spent some time on that scenic strip of beach known as 30A where people ride bicycles pretty much everywhere. We fell in love with cruising our bikes down the sidewalks at the beach. The girls loved hitching a ride on the bike trailer. It was magical. Naturally, we wanted to recreate that magic back at home. We headed to our local bike shop and STOCKED UP. I think we left our brains in Florida because it’s hotter than hot here in South Texas, and our neighborhood and surrounding area is not flat. This means we’ve ridden these bikes approximately two times since May. Once that temp and humidity drops, we’re hoping to recreate that beach bike magic…minus the actual beach and sea breeze. We love to head out on walks through our neighborhood. My husband mapped out a route, and it’s so nice to wrap up our day with a little stroll. I think it’ll be fun this year to ditch the stroller from time to time and have the girls walk with us - on a shorter route. Refer to activity above for why we’re waiting on cooler temperatures. This is one I’m DOING this year no matter what it looks like. I’ve been determined to do this every single November, but I get hung up on the details of what it should look like, how to make it perfect, blah, blah, blah. My quest for Pinterest perfection has kept me from doing any sort of gratitude practice at all. So, this is the year. It’s probably going to look like a strip of brown kraft paper taped to our kitchen wall. Let’s call it “rustic” and move on. The intention is to have each of us in the family take a moment to write down (with assistance, if needed) something we are thankful for that day. My plan is start November 1st and finish up on Thanksgiving day where we can read through all of them together. I’ve always wanted to participate in those “random acts of kindness” challenges that pop up in December, but honestly, I’m way overwhelmed in December. My goal is to dole out some “gratitude gifts” to our postal workers, sanitary workers, school employees and anyone else we want to say, “THANKS!” to for their hard work. We’re going to keep it simple, simple. I’ll share more ideas on this later. Let’s be honest, this is no one’s favorite but mine. My philosophy is that my kids and husband will thank me for these precious photo memories later. This one right here brings me right back to my childhood. My mom made this every year throughout the holiday season, and it was my absolute favorite. I’m going to attempt to make her recipe gluten free just for giggles. We’ll see how it goes. The recipe involves rum, so it can’t be ruined, right? Just kidding. I’ll probably make it both ways and do a taste test. I’ve heard of “Friendsgiving” before as a fun way for adults to gather and celebrate Thanksgiving as a friend family - or “framily”, but I’d love to extend that to a playdate for the kids to share in the tradition of thankfulness for each other. It could be at a park, at a house or anywhere you can gather a large swarm of children. I’m picturing potluck lunch goodies and a chance to speak about things we’re thankful for in our friends. Clearly, no one will be sitting too long, so we don’t even have to worry about a formal table to set! There you have it! This list is NOT going to be a checklist because when I have a checklist I tend to get a little “box checking” happy and try to blow through the tasks versus truly enjoy them. So, this is our guide to fun this fall but not hard and fast “have tos” - well, except for the Thankful Tree. I really want to make that one happen - Pinterest worthy or not. I’m hoping for many memories for you and your families, too!